Not much to say here about The Jargoon Pard except on a personal note. The story is a solid, by-the-numbers fantasy quest as Kethan is forced to discover his true heritage. It's set in Norton's Witch World but isn't, IMO, one of the more memorable entries, and would only recommend it to a Norton completist. The characters are not very complex (though Ursilla could have been a really nasty villain if given more room to develop), and the ending stumbles into the deus ex machina snare. JARGOON - Noun. A colorless to smoky gem variety of zircon. 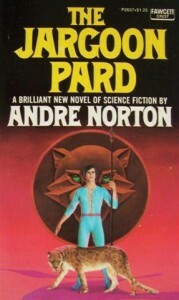 PARD - Noun. A leopard or panther. So I'm sticking with the cover of the library book I checked out as a callow youth.